The video shows how a spring suspended from one of its ends reacts when its dropped. It can be observed that the lower end “doesn’t know what happened” until a wave propagates to it. In this post we will make a computer simulation of its behavior, to see if we can reproduce the phenomenon, and in the next we will apply a more analytic approach to the same problem. Slinky discretization, showing how the discretized element properties relate to the original ones. If we divide a slinky of total mass in small masses, each of them will have the value . 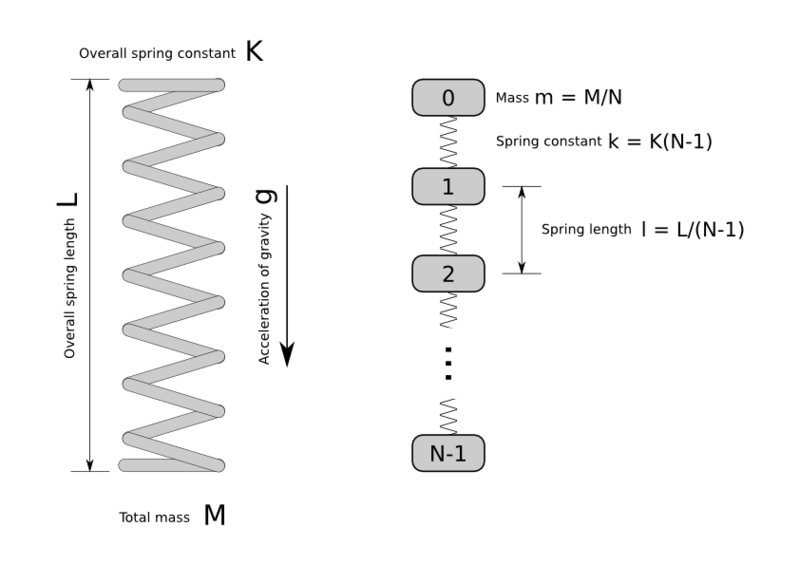 As the spring constants of series springs add as the resistances of parallel resistors, if we have a slinky with overall spring constant divided into smaller springs, each of them will have a bigger spring constant, and (obviously) a smaller unstressed length, . where are the coordinates of the masses (with going from 0 to ), is the acceleration of gravity, is the spring constant of each massless spring, is the value of each small mass, is the unstressed length of each massless spring and is the discrete Heaviside step function (used to avoid depending on undefined values). The remaining code is just plumbing and matplotlib presentation code. The whole program can be seen at the repository. A simulation where the springs are too soft, giving some negative spring lengths (and consequent overlapping) near t = 1. 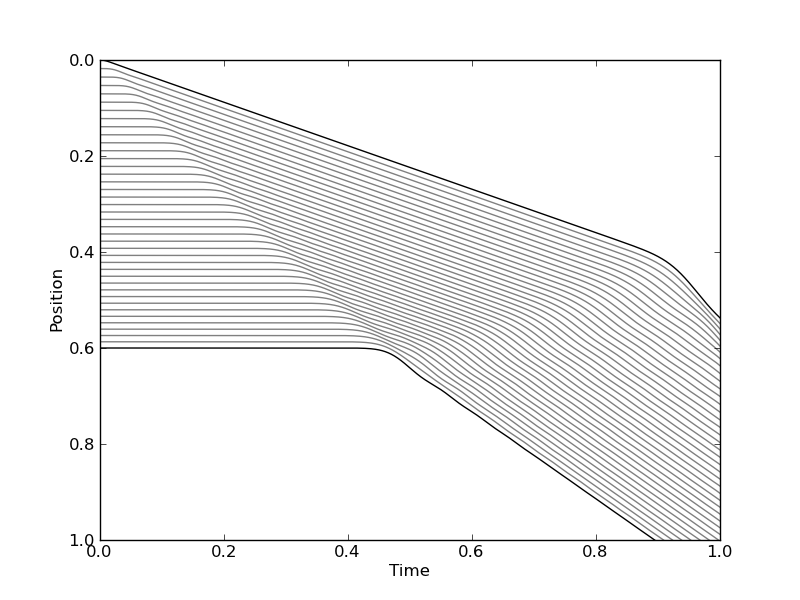 In this plot the gray lines represent the trajectory of the small masses and the black lines the trajectory of the slinky’s ends. A simulation where the springs have a physically reasonable constant, giving an intriguing behavior to its ends. 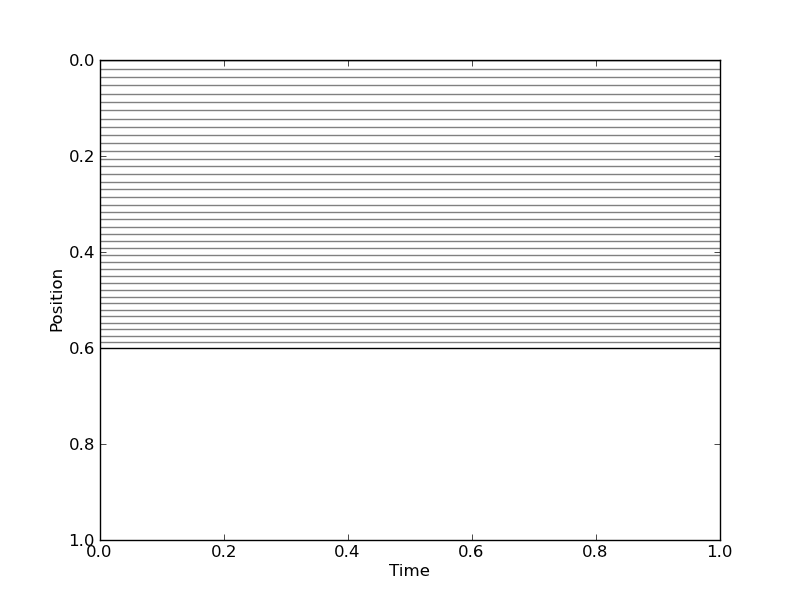 Simulation to check if the slinky remains stationary when held from its upper end. This simulation validates the main point of the original video: the lower end “doesn’t know” the upper end was released until a compression wave reaches it, at in our simulation. But the detailed behavior differs, as the slinky only shows a compression wave once it reaches the nonlinear regime (when is no more space between the spires). 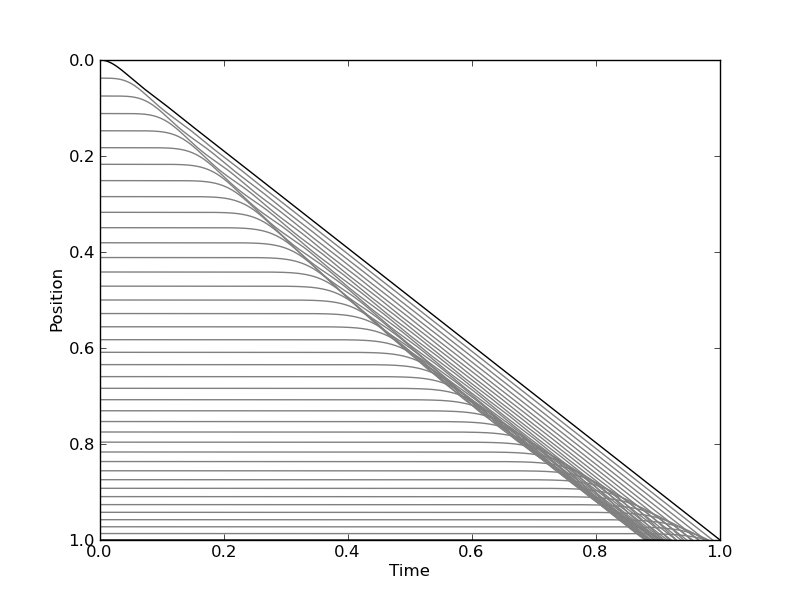 In the next post we will show an analysis of this nonlinear behavior and the analytical solution to the idealized slinky drop that was numerically simulated in this post.